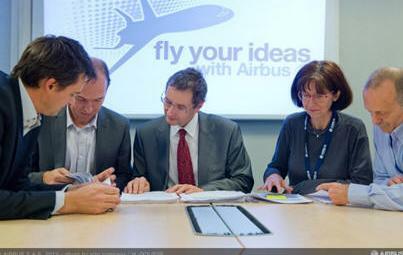 December 19, 2012 - More than 6,000 students of over 100 nationalities registered for Fly Your Ideas 2013, the global university contest organized by aircraft manufacturer Airbus. Teams of students are challenged to develop and submit ideas for a more sustainable aviation industry in the future. Twice as many students as in the previous competition have registered this time. The students are looking to secure an invaluable opportunity to work with aviation’s top experts to develop their idea further and a chance to win the prize of almost $40,000 USA. “There has been a remarkable increase in the number of entries and we have maintained a great mix of participants” explained Charles Champion, Airbus Executive Vice President of Engineering and Fly Your Ideas patron. “We are really excited by this as we believe that innovation is driven by diversity in backgrounds, nationalities, as well as gender.” he added. The teams must complete three progressively tougher rounds in order to progress to the final stage when they will present their project in front of a jury of experts with the award to be presented at the UNESCO headquarters in Paris in June 2013. Following 6089 registrations, 618 teams of 3 to 5 students comprising 2556 participants of 82 nationalities submitted a one page proposal to enter Round One of the Fly Your Ideas challenge. UNESCO has given patronage to the 2013 edition of the Fly Your Ideas competition to help advance engineering education which is focused on finding solutions for a sustainable future. Competition Calendar: Round One - 3 September 2012 - 7 December 2012 (One page proposal). Round Two - January 2013 - April 2013 (up to 100 teams chosen to deliver a 5000 word report and a short video). Round Three - May 2013 - June 2013 (5 teams chosen to present to a jury of Airbus and industry experts). Final presentation and awards – June 2013. WINNERS 2009: Australia - The multinational team ‘Coz’ from the University of Queensland, Australia, were awarded the winning prize in June 2009. Their project focused on the use of a pioneering natural fiber composite - made from castor plants in aircraft cabins.